Exhale and retreat to a fairytale setting on the grounds of a historic castle in the countryside of Fribourg and Bern, Switzerland! Escape the ordinary and make time to wander through streets in a medieval walled town, relax into the gentle and easy pace. 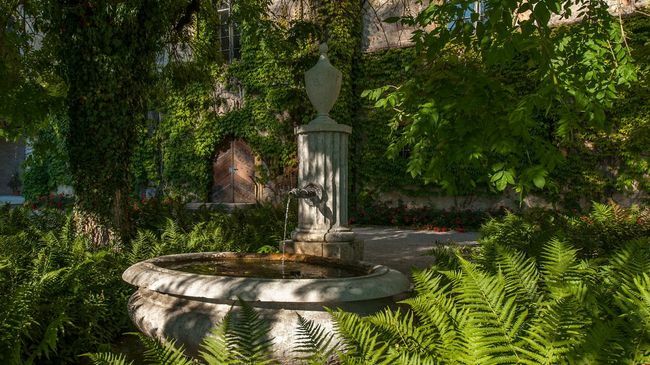 Connect with kindred spirits while exploring, knitting, and spending a restorative week in the serene setting around Münchenwiler Castle. Tucked into the hills just beyond Lake Murten, between Lausanne and Bern, it is situated at the edge of the wine growing region. The award winning Castle restaurant offers us fresh, seasonal and local foods and there will always be a glass of wine included with your dinner! Enjoy 12 hours of knitting classes taught by 2 talented and inspiring knitting instructors. During your relaxed knitting classes which are held in beautifully restored rooms in the castle, we are treated to fruits, coffee breaks with croissants and water from the castle’s own spring. And rest assured that there is plenty of free time to simply sit and knit, or go for walks, sit in the sun in the castle garden, stroll through the castle grounds and relax. And all of it in Switzerland. Some of the additional excursions we have planned are a day trip to the Cailler chocolate factory (Simone’s personal favorite brand as far as Swiss chocolate goes!) and visit to the medieval town of Gruyères with it’s picturesque castle. If it is nice we might want to come down to Murten for a dip in Lake Murten, but either way, we will visit the medieval town of Murten with its protective wall, parts of which we can walk to enjoy the view of the surrounding area and the lake. Knitterati Retreats is a slow paced experience of a corner of my beloved home country, Switzerland. No one will be dragging you on endless bus tours from place to place at lightning speed only so you can forget what you took all those frantic pictures of by the time you get home. Settle in, breathe, relax, knit and discover a piece of Switzerland to cherish forever in your heart! While we won’t be doing any hiking or hour long walking, you should be able to walk at least a mile comfortably to make this trip a pleasant experience. Both the chocolate factory/Gruyères and the town of Murten trips have cobblestone streets and require us to walk, sometimes uphill. This location can accommodate some dietary restrictions, please contact us prior to signing up, if you have any such concerns and we can check with the chef to see if allergy specific meals can be arranged. This intimate retreat is limited to 30 participants. Historic Château Villars-les-Moines oder Schloss Münchenwiler, situated above Lake Murten (or Lac Morat) in the lake district of the bilingual Canton Fribourg will be our home for this retreat. The bedrooms are located in the guesthouse built in 1990 and the rooms themselves quiet the mind and radiate a calm and functional beauty harking back to the estate’s humble beginnings as a monastery. All prices are based on single occupancy. 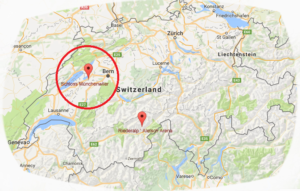 You are responsible to make your own flight arrangements from an airport near you to Zürich (ZRH) and ground transportation to Schloss Munchenwiler. Zürich is one of the major airports in Switzerland and you will probably get the best fares flying here. For this location, it also is the closest. We will gladly help you with train and bus schedules to help you have a smooth transit to the Schloss. Also, if enough participants arrive around the same time at the airport, we can organize a shuttle to pick everyone up for an up charge. Please let us know if you might be interested in that and we can try and coordinate with the other travelers. Please do not book any airfare until you have checked with us, as all our retreats need a minimum number of participants to be able to run! For this retreat we are happy to welcome Nancy Marchant as our guest instructor along with Simone Kereit (OwlCat Designs). More details on the class pages, but there will be a total of 12 h of knitting lessons, 6 hours with each instructor. Split over several days, with ample time to relax and enjoy the world around you. You don’t have to make any decisions, you will be taking all these classes and get to enjoy a host of new inspiration and techniques to take your knitting a step further! Includes lodging, meals, scheduled tours and day trips, local transport, knitting classes, retreat tote bag, yarn and goodies. You just need money for extra wine (a glass will be included with your dinner! ), chocolate, personal expenses or any other trips that you might want to take (maybe a afternoon at lake Murten, or a bus trip into town), oh, and did I mention chocolate? Does not include airfare from your airport to Switzerland nor airport transfer to Schloss Münchenwiler. Register here now! A $650 non-refundable deposit is required to secure your reservation, an installment of $1250 is due by February 15th and the remainder $1200 is due by March 30th, 2018. If you are paying by check, $50 will be deducted from your last payment. The $50 Pre-registration fee is non-refundable. Deposits are non-refundable or transferable. Please do not make any travel arrangements until you have checked with us, as all our retreats need a minimum enrollment to be held.